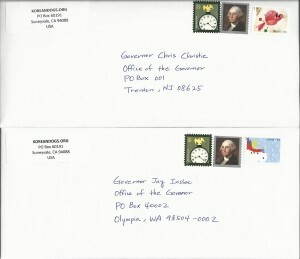 Governors of Washington and New Jersey: Tell Sister State, Jeollabuk-do, South Korea, That We’re Opposed to Torture and Consumption of Dogs and Cats! Jeollabuk-do Province of South Korea became a sister state with Washington in 1996 and New Jersey in 2000, despite the fact that Jeollabuk-do, South Korea is responsible for a horrendous dog and cat meat trade. In South Korea, home to global companies such as Hyundai, Kia, Samsung, LG, Daewoo, SK, and POSCO, an estimated 2.5 million dogs are tortured and slaughtered every year because of the greed of dog eaters and the dog meat industry, and the profound indifference of the majority of South Koreans who do nothing to stop this. One of the provinces which supports the illegal mass breeding and brutal slaughter of dogs for human consumption is Jeollabuk-do. Have you ever wondered what Hell is like? Click HERE to watch undercover videos from a dog slaughterhouse in Gunsan, Jeollabuk-do. There are no words to describe the daily horror of this “Hell On Earth.” There are so many dog slaughterhouses, farms and meat markets like these all around Jeollabuk-do. Countless dog farms and slaughterhouses are scattered throughout Jeollabuk-do and they truly are hell on earth for the defenseless dogs suffering there. Man’s best friend exists for their entire lives in squalid, feces encrusted raised wire cages in utter misery only to be slaughtered in the most horrific of ways – by electrocution, a hammer blow to the neck, being hung or beaten, bleeding to death from a slashed throat, being burned to death from a blowtorch, or thrown into a vat of boiling water while still alive. Jeonju, Gunsan, Iksan, Jeongeop, Namwon, Gimjae, Wanju, Jinan, Muju, Jangsu, Imsil, Soonchang, Gochang, Buan; and on goes the list of cities in Jeollabuk-do where these terrible atrocities are perpetrated. New Jersey should not be a sister state to any province that allows dogs and cats to be tortured and eaten. 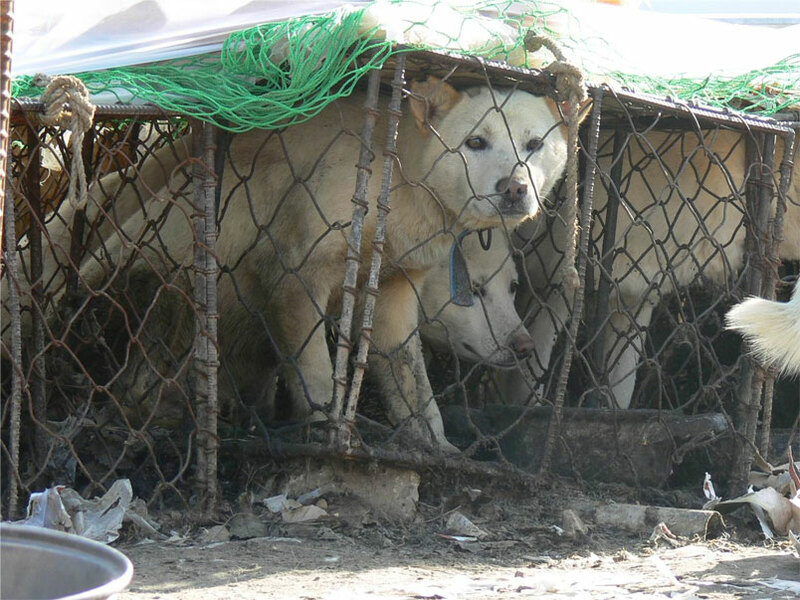 Please urge Jeollabuk-do Governor Ha-Jin Song to close down all illegal dog farms and slaughterhouses, markets, truckers and restaurants who serve their products. An online petition calling for your support in ending the horrendous South Korean dog and cat meat cruelty is in progress: https://www.change.org/p/washington-and-new-jersy-tell-sister-state-jeollabuk-do-south-korea-that-we-re-opposed-to-torture-and-consumption-of-dogs. No matter where you live PLEASE SHARE these actions with your friends – especially those who live in Washington and New Jersey! 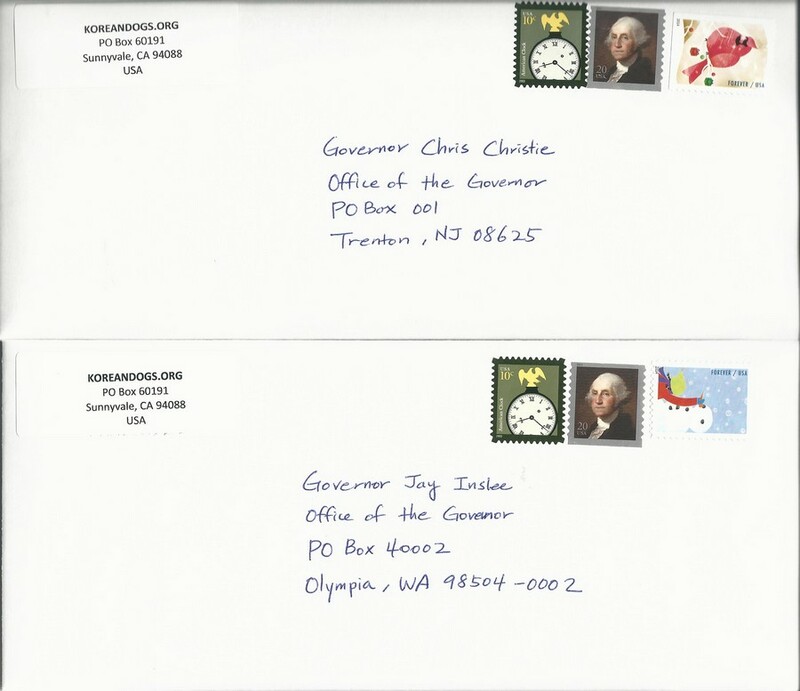 Update June 19, 2015: We mailed our petition letters to the Governor Inslee and Christie. Can we count on your voice, too? You are all so right about the need for the humane treatment of animals! Please boycott all S. Korean products, including Hyundai, KIA, LG, Samsung, Daewoo and others. As responsible consumers, we can make a huge difference by carefully buying only products that do not support animal cruelty! We should all write letters to the Int’l. Olympic Committee urging them to find another venue for these games in 2018. Golf tournaments and other agreements with S. Korea need to change venues as well! If we do not support this barbaric country’s cruel treatment of animals, it is possible that the govt. may make some much-needed, positive changes for animals. please stop eating dog meat. Why are we partnering up with these barbarians? How cruel and horrific to abuse and torture innocent animals — only the mentally unstable would engage in such an activity — this is a hateful, unconscionable, irrational, merciless, needless trade — WHO’S PROTECTING THE ANIMALS? SHAME ON ALL OF YOU! Please help stop animal cruelty. STOP KILLING DOS AND CATS DONT EAT DHEM!!!!!!!!! This cruel and shameful dog meat trade MUST STOP immediately! NO more horrible and cruel dog meat trade. STOP this!! NO more cruel, barbaric and shameful dog meat trade!! STOP this immediately! Already they do not continue to ill-treating all the poor dogs because they are innocent and defenseless .. they need to saving them …. the animals and human beings we have rights!!!!!!!!!!!!! … please..
It’s intolerant in the XXI century to see such a barbarism! We have to act to stop it!